During the winter months, Aspen’s Gold Medal fisheries continue to offer high quality fishing. Lower water levels, less angler pressure, and hungry trout make for an experience not to be missed. Sunny days with average temperature in the upper 30s and 40s make a great way to take a break from skiing and enjoy the spectacular scenery of the Roaring Fork Valley. Can’t bring yourself to skip the ski day? Make sure to get that first chair for the best turns of the day in the morning, and meet us back at the shop for an afternoon on the river! Aspen and the Roaring Fork Valley are a beautiful setting for both experienced anglers and complete beginners to enjoy this unique and truly rewarding activity all year round. 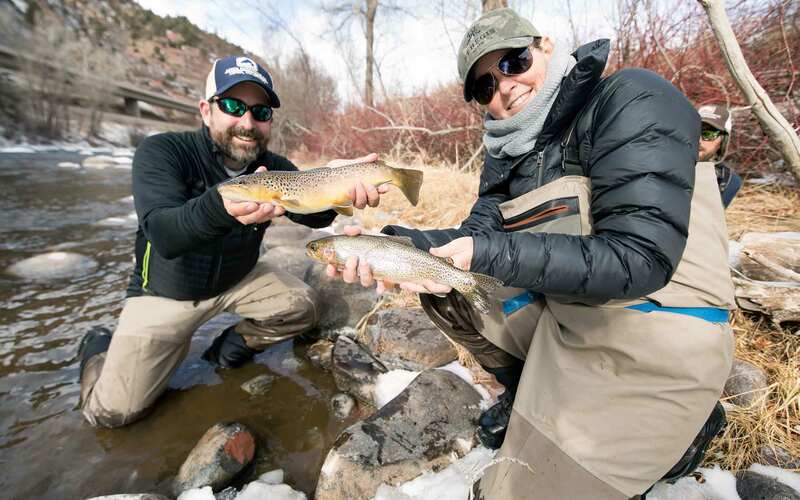 The Roaring Fork River, located just 10 minutes from downtown Aspen, is known as ‘Gold Medal’ fishery – a designation only given to the very best fisheries in North America. Whether you are a complete beginner or have been fly fishing for years, you will appreciate our intimate knowledge of the local water and our passion for the sport. Our thoughtful and attentive guides will make sure your day on the river is one to remember.